Where would you typically go to Shop Wedding Shoes? A mall? Browsing through e-commerce sites? Retail stores? We spend so much of our time obsessing over our wedding clothes. That we often tend to keep the wedding shoes matter on the side. But let’s all agree. To Shop Wedding Shoes is equally important in achieving the overall princess look, right? I mean even Cinderalla had her glass slippers on, so why should you settle for anything less? If you are looking to Shop Wedding Shoes in India, you’re in luck. There are quite a few luxury brands and designers who are doing amazing unique footwear fit for a royal bride. Some of these labels do cost a bomb, but are well worth it. But if you are a budget bride, fret not. There are some budget friendly wedding shoes options for you as well. 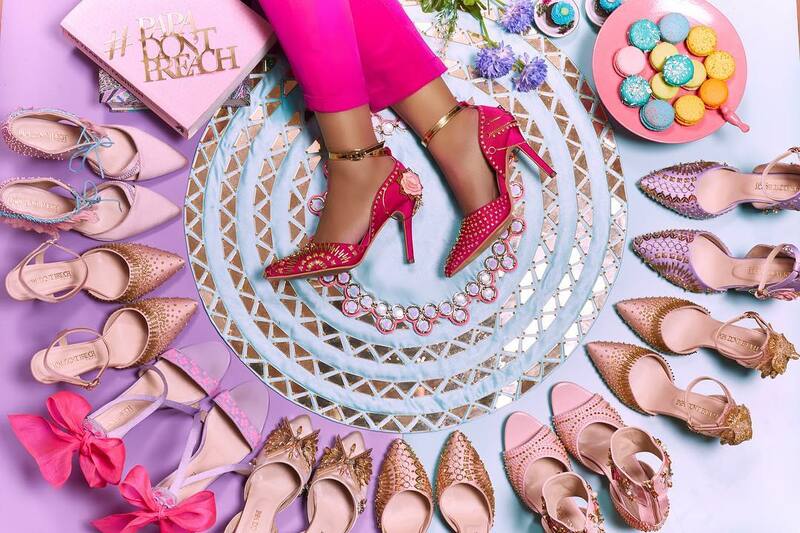 In this post, I will be covering a list of my favourite brands/labels to Shop Wedding Shoes in India. This post will not include any of the jutti brands. In case you want to know where to buy juttis from, I have a separate post on that as well. Where To Buy Juttis From In India? If you think spending 3000 on a pair of juttis is a bit much. Here’s what you can do. A lot of retail shoe brands like Metro and Regal are also having juttis in their collection. Watch out for their sale season. I personally picked up an embroidered jutti from Metro sale for a mere INR 400 bucks! If you are open to colours, then sale time is the best time for you. Fallen leaves, is our first of its kind from the avante garde series. We represent here, a limited edition piece representing state of the art in innovative footwear design. The series breaks away from conventional footwear norms and envisages a paradigm shift. It is a three dimensional representation of fallen leaves and makes your foot look and feel like its walking in a wonderful neverland. Our signature soft and cushioned nappa lining and inside of the shoe makes it durable and efficient in wearing for long hours and dancing away at festivals. This particular heel from Dyuti Bansal is from their Avant Garde collection. It’s the most premium wedding shoes on their website. If you are looking for a one of a kind designer wedding shoe, look no further. I happened to come across Dyuti Bansal brand by chance, and what a find this is. It is an expensive label to Shop Wedding Shoes for sure. But there are some gorgeous wedding 3d wedding shoes that I know you’ll love. The most comfortable pair of clog sandals in an ethereal gold and grey combination. Hand embroidered with wildflower motifs and embellished with an antique gold stain. Dress it up with a lehenga or dress it down with trousers or a dress, this is a staple sandal for all. Chic, extremely comfortable and cushiony sandals in an exquisite champagne gold. Hand embroidered in a full zardozi technique in ombre cotton threads, done by artisans from bengal. Dress it up with a lehenga or dress it down with trousers or a dress, these sandals will be your best companion. If I have to give you one advice to Buy Wedding Shoes, it’s that you need to find a comfy pair. The last thing you want is your feet hurting on your big day. Go for flats if heels are not your thing. Heels are great for photography, but in case you’ll be dancing and moving around, stick to flats. Where Can You Shop These From? My newest favourite shoe brand this year is Papa Don’t Preach. Conventionally known for their quirky ethnic and fusion wear. This brand has now extended with their own line of wedding shoes as well. The style of Papa Don’t Preach is fun, playful, girly with a big quirk element to it. You will see lots of candy colours of pinks, lilacs, purples and hints of pop colour with a lot of sequins work. These wedding shoes are perfect for your sangeet, cocktail or mehendi event. If you happen to wear one of the Papa Don’t Preach outfits, you can even coordinate your footwear accordingly. To Buy Wedding Shoes, these bridal shoes are a bit of an investment. But if you look at some of the western counterparts, they still are in the mid-affordable range. Just to give you an idea, wedding shoes with crystals and Swarovski can range from INR 15k to INR 40k a pair. If you are looking for a typical wedding-wedding shoes, like match-matchy. Then this brand has a lot of good options to go for. You can pick shoes based on your lehenga colour, or go for classics like gold wedding shoes. There are tons of varieties, and from the looks of it, these look pretty comfy. Wedges like this one will always feel more comfortable than stilettos and pumps. Whether you have a saree on or a lehenga, these look pretty nice in both of them. The only bit that I don’t like about wedges is that may tend to look bulky. But if you’re ok with that, then this is a great option to go for. If you like traditional Kolhapuri chappals, and prints then The Shoe Tales has quite a few options for you. you can easily wear these flats with any of your ethnic wear outfits. They are colourful, trendy and somewhat easy on the pocket as well. Seen these crystal studded heels on Pinterest? Didn’t know where to buy these from. Well, now you know. In fact, the American similar brand heels are no less than INR 15k a pair. So you’re definitely getting some discount here. All of Talon D’or footwear can now be bought from Veruschka’s website. Talons D’or has now shut shop. But if you like any of these designs contact Veruschka. These 4 inch gold glitter wedges are just perfect for your wedding collection making you stand out in the crowd. These will go perfectly with your ethnic wear giving you a perfect traditional look. An elegant artwork of crystal beads perfectly fits on as a T-Bar in this Sandal. This pair can be made in any of the materials available on the website. You can perfectly match your lehenga to this piece and the center piece provides an elegant shine to it. Seen a lot of brides who wear these customised bridal footwear? Well, now you can have one too. Sole House has a bunch of these fun bridal flats that you can wear and walk around in the house months before the wedding. It’s also a great gifting piece from bridesmaids to the bride. Trendy wedding shoes. Loved it!